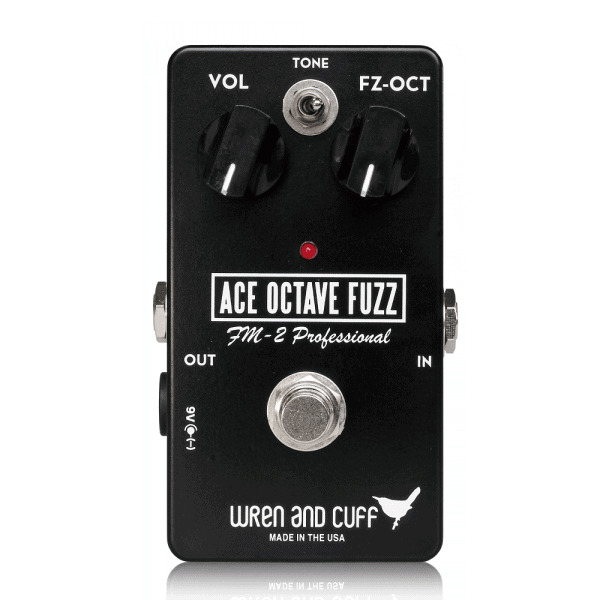 The Ace Octave Fuzz is a precise recreation of the famous “Acetone FM-2 Professional”. This is a bold, rich, fuzz with a very clear octave-up, especially once the player goes beyond the 12th fret. A much different pedal than the Tycobrahe Octavia or Univox Superfuzz, this pedal has a tone that is uniqueamong octave fuzzers. The “Tone” toggle switch provides the option of a more mid-range focused sound, or a fat girthy sound with tons of extra lows. As with all Wren and Cuff recreations, we did not only use a schematic to make this pedal, we actually used vintage units, removed parts, and attempted to replicate the tone of a pedal that has been used for many years. The Wren and Cuff Ace Octave Fuzz will be a unique addition to your board that will inspire your playing with its raunchy goodness.